A soft paste, bone ash porcelain dinner and dessert service in the rococo style with 'Mazarine blue' ground and gilded decoration illustrated with birds and flowers. 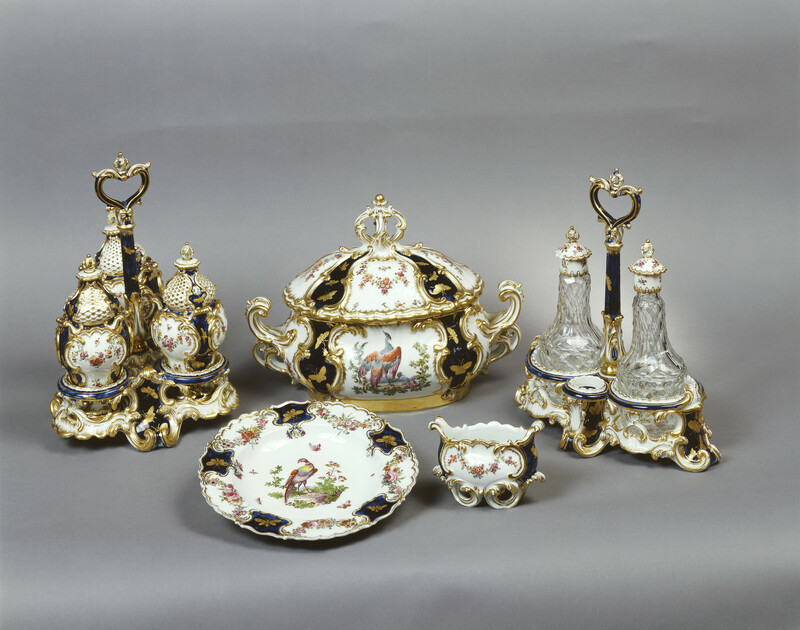 This exceptionally grand service was completed in March 1765; it marks a change in the custom of using silver to furnish dining tables by including ceramic candelabra and the large centrepiece although they retain metalwork shapes. This is not surprising given the manager of the Chelsea Porcelain Factory at the time was the silversmith Nicholas Sprimont (1716-71). 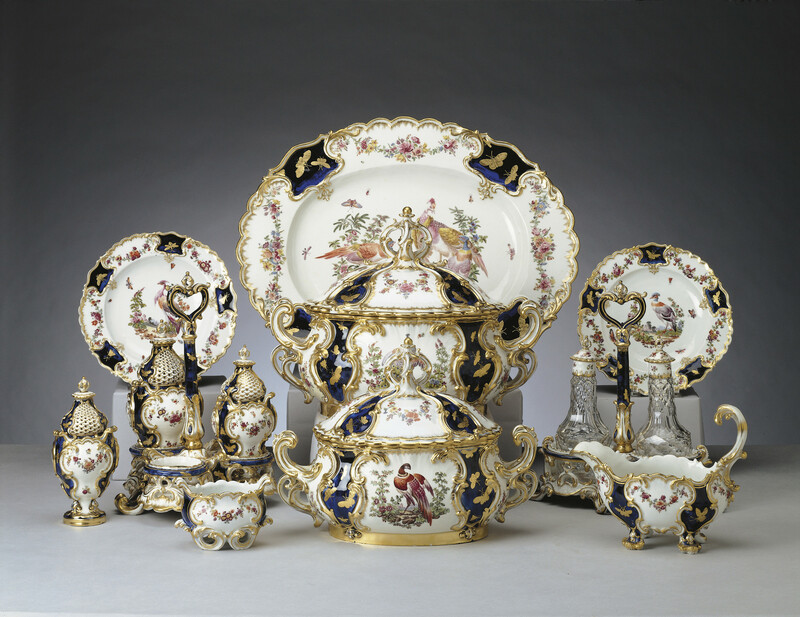 In October 1766 the traveller Thomas Nugent noticed among the other 'curiosities' in the palace at Neustrelitz 'a complete service of Chelsea porcelane, rich and beautiful in fancy beyond expression. I really never saw any Dresden porcelane near so fine; her Majesty made a present of this choice collection to the Duke her brother'. The Duke was Queen Charlotte's older brother, Adolphus Frederick IV, Duke of Mecklenburg-Strelitz (1738-94). There are 137 Chelsea pieces in the Royal Collection with 5 replacement pieces from the Königliche Porzellan-Manufactur, Berlin. Commissioned by King George III and Queen Charlotte, by whom presented to her brother, Adolphus Frederick IV, Duke of Mecklenberg-Strelitz in 1764. By descent until 1919; Sir Joseph Duveen: James Oakes by whom presented to HM Queen Elizabeth, 1947 for her Silver Wedding anniversary.